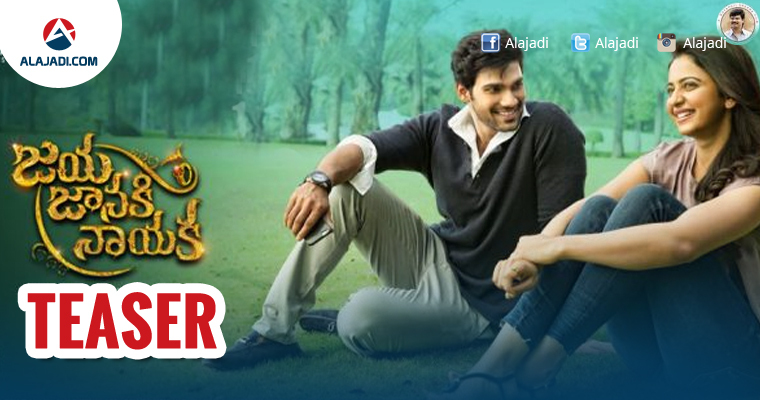 » Jaya Janaki Nayaka Teaser Is Out Now ! The first teaser of Director Boyapati Srinivas’s upcoming film ‘Jaya Janaki Nayaka‘ starring Bellamkonda Srinivas and Rakul Preet Singh in lead role, is out today at 11.20Am. The film grabbed the attention of audience with first look poster featuring Sreenu and Rakul Preet. In the first look poster, This first look poster is truly promising with a pleasant romantic tinge. While Rakul is cute in a regular costume, Srinivas dominated with a confident body language and stylish look. In another poster, the actor looks fierce and raunchy. The teaser of ‘Jaya Janaki Nayaka’ looks visually rich, romantic and breezy. Boyapati’s mark of action was shown in not even a single shot. This teaser looks completely opposite to the teaser of his last film, ‘Sarrainodu’, which was Oora Massy. Probably, the team will unleash the mass angle in JJN in the trailer or another teaser. Coming back to the teaser, it is quite breezy and serene with appealing shots of lead actors Bellamkonda Sreenivas and Rakul Preet Singh. It is high on romance, colorful visuals and soothing background score form Rockstar Devi Sri Prasad. It seems that Boyapati has made this film in order to prove his detractors that he is adept in making romantic films too. Jaya Janaki Nayaka is said to be a wholesome family entertainer with Director Boyapati’s action and commercial elements in it. The also features Pragya Jaiswal, Aadhi Pinisetty, Jagapathi Babu in important roles. Film’s music composed by Devi Sri Prasad. The film is produced by M. Ravinder Reddy on Dwaraka Creations banner. Makers are planning to release the film on August 11.